Hinoki Falsecypress, Chamaecyparis obtusa is a beautiful evergreen conifer, native to Japan, where there are majestic individuals over 500-years-old. This tree may reach 50 to 75-feet in height, although there are many compact, and dwarf-sized, cultivated varieties used in landscapes. The etymology derived from Greek is chamai meaning on or of the ground, and kyparissos meaning cypress tree. The rich, dark green, scale–like leaves are blunt at their apex, hence the Latin name obtusa. When referring to scale-like leaves within conifers, we define these as comprising two different pairs of leaves (lateral and facial) perpendicular to themselves, repeatedly running the length of a twig. The lateral leaves have edges which are seen to the right and left of the facial leaves (as might be at 3 and 9 o’clock), while the facial leaves are at the top and bottom of the twig when viewed from above (at 12 and 6 o’clock). There are white x markings found on the bottom of these opposing pairs of leaves. Many of these leaves together make up a dense, fanlike, flattened spray. The bark is attractive, reddish-brown to silvery. The cones are round, 1/3” to ½” across, with 8 to 10 scales, spilling out tiny, winged seeds. 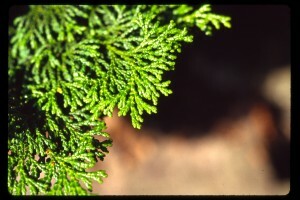 In Japan Hinoki Falsecypress, Chamaecyparis obtusa, along with Japanese cedar, Cryptomeria japonica, are considered culturally significant, even sacred. Countless shrines and temples honoring Shinto religion have been built using hinoki wood columns. This decay and rot resistant wood has an earned reputation of long durability and high quality, hence its timber is very expensive. Ise Grand Shrine, in Mie Prefecture exemplifies the reference for hinoki wood. In a 1300-year-old tradition, scores of wooden shrines are repeatedly replaced with adjacent new buildings, often reusing hinoki wood. These are built using post–and-lintel construction, with a limited use of nails or glue. In addition to hinoki columns, several shrine roof types use hinoki shingles. Nearby are hinoki plantations, to insure future availability of this revered lumber. On a future visit to Mount Auburn look for Hinoki Falsecypress on Pyrola Path, and Redbud Path. 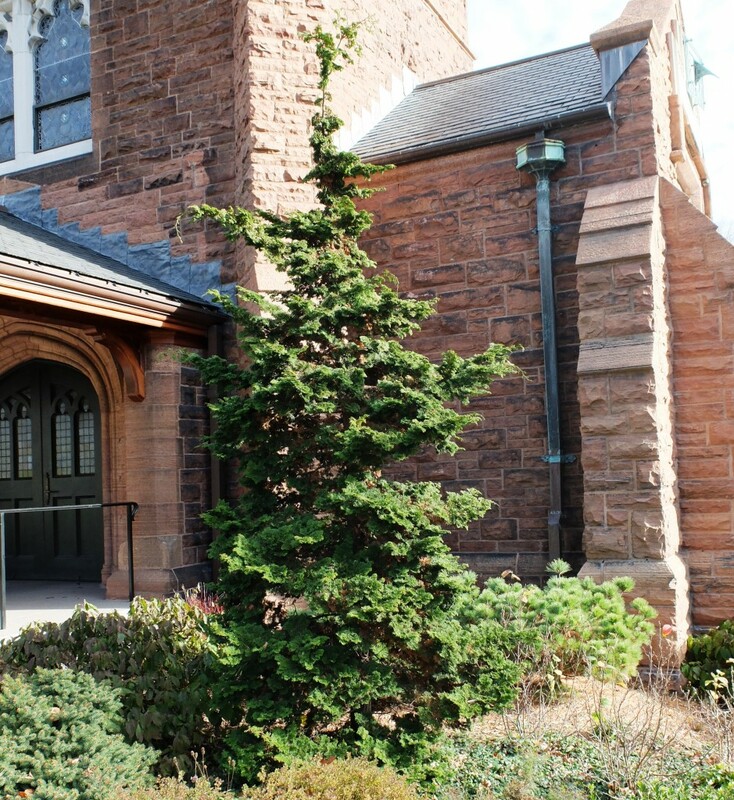 We also are growing over seventy reduced maximum sized cultivated varieties throughout our landscape, including two in front of Story Chapel. 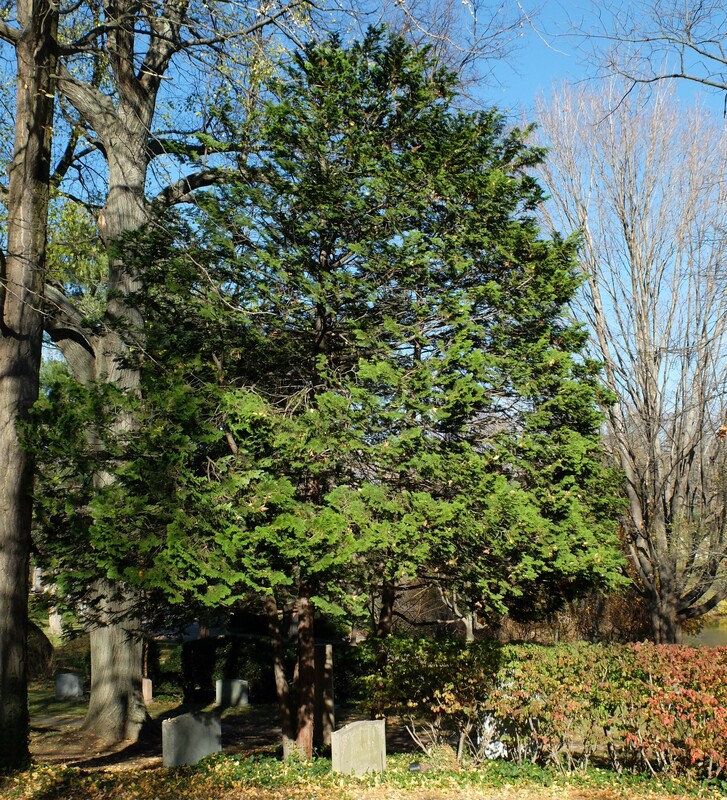 Especially enjoyed the slide show showing so many of these trees throughout the cemetery. Nice job Jim!